You are here: Home » MEDIA » Books » How Dark The World Becomes by Frank Chadwick (book review). 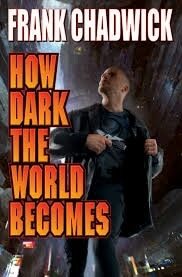 How Dark The World Becomes by Frank Chadwick (book review). Sasha is mid-level gangster involved in the usual smattering of criminal activities: drug dealing, protection and numbers. He seems like a nice guy, so far as thugs go. He funds a clinic, is good to his girlfriend and is apparently respected by his peers, except for the one who’d like to see him dead. To complicate matters, he has been asked to smuggle two high value targets off-planet. There is a thread of connection between matters, but everything in the squashed and squalid depths of Crack City seems related. That’s how slums operate. Simplest solution to all current problems seems to be to accompany his alien cargo off-planet. Trouble does what trouble does and follows. There are two plots here, the one involving Sasha and the one involving the two alien children he is trying to protect. They’re somewhat related, in that the galaxy isn’t as big as it thinks it is sort of way. But it seems that the more Sasha tries to convince everyone he’s just a thug, the more he has to stand up and do the right thing, to save his own neck, the children, their minder — a woman who seems less objectionable as time wears on, various hangers-on, an entire platoon of marines, a planet and, just maybe, the fate of the human race. The bigger his problems get, the more determined Sasha becomes. ‘How Dark The World Becomes’ fits neatly into one of my favourite Science Fiction sub-sets: the thrilling adventure in space. Take a hero who doesn’t really want to be a hero, strip away the things he cares about and then set him an impossible task. He’ll either fail miserably or succeed against all odds. In the best stories, he does a bit of both. While reading Frank Chadwick’s book, I was reminded of Jack McDevitt’s ‘Alex Benedict’ novels and Mark L Van Name’s ‘Jon & Lobo’ adventures. Sasha, as a character, had the same self-deprecating attitude and the tenacity to get things done, even as events messed with his carefully ordered life. I really enjoyed the world building, too. Crack City, as a concept, both amused and horrified. Humanity rests at the bottom of the pecking order, their labour supporting the rest of the galaxy. I loved how fascinated aliens were with human culture and the way they imitated imperfectly certain aspects. These scenes only served to highlight some of our own more absurd behaviour in a sometimes darkly humorous manner. I got the sense Chadwick has a lot to say about some of our more oddball quirks as a species. I think Frank Chadwick’s universe and characters have a lot of potential. Given he is a multiple-award-winning game designer, I’m not surprised. I’m looking forward to reading more! « Signal To Noise by Neil Gaiman (Writer) and Dave McKean (lllustrator) (graphic novel review).